I’ve been waiting for this game to come out since the moment it was announced. I’ve played Grim Fandango and Phsychonauts before this, and I really enjoyed those Games. (For those of you who don’t know, these are both games by Tim Schafer, and they’re AWESOME! I didn’t have a console at that time, so I thought I’d have to wait and see if it would come to the PC at some point. BUT! Now I have a PS3! So that’s all good! 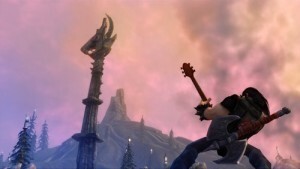 The game is about a roadie named Eddie Rigs, who gets warped into a supposedly distant past, into the Age of Metal. The humans who live in this world are being oppressed and live in a dark an hostile world full of demons and creatures straight from the cover of a metal album. Eddy finds out that metal music has enormous powers in this world, and he knows what the people need to tap into the power of metal, and free themselves. He becomes their roadie! It really pays off to take the time and just drive around in your overpowered car, and explore the country side. As with a lot of games these days, I have one tip for people playing this game: LOOK UP from time to time. When in any given area, just stand still for a while and look around. There’s some really nice and epic scenery here! I think the characters in this game are what you can expect from Tim Schafer. (For those of you who haven’t played Phsychonauts and/or Grim Fandango GO GET IT NOW!!!) Every notable character in the game world has something to say, a personality, and a background. A lot of characters are voiced by or sometimes even modelled like some of the great metal singers of the heavy metal industry, likeOzzy Osbourne, Rob Halford of Judas Priest, and Lemmy Kilmister of Motörhead. Eddy is voiced by Jack Black, which I think he did very well. It’s not some tagged on celebrity voice acting. It’s really well done and the voice acting in general for this game is superb. I will not go into detail about what character you meet where, and what they are like, since I think you’ll better find that out for yourself as you get taken in by the games great story line. If you only follow the main story line and don’t go out to explore, the game can be rather short aside from the fact that you miss out on a lot of great level designs, unlock-able upgrades for your car, axe, guitar and great metal music. As you play along, and see more of the world, you can also unlock concept art to view from the game menu as a bonus. 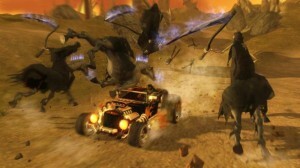 The game also features a multi-player mode where you can play online against friends or other players. You can pick your favourite army out of 3, and play on one of the specially made multiplayer maps with different themes in terms of landscapes. I really enjoyed the game. Most of the time I spend driving around exploring the country, trying to find special items/locations to look at and just take in the atmosphere of this big Metal World to the tune of a LOT of great metal music . People say the side missions are not deep enough, but in my perspective, there are no side missions. The little things you get to do in the game world do not have any real story to it..They are more like in-world minigames, and can be quite fun too. I used to just pick up the controler and play the game for like 1 hour or 2 every evening… In which blasting through this metal world, meeting some funny characters, and the occasional slaughtering of demons, made for a very relaxing, metal experience with just great atmosphere. And whenever I felt like it, I continued on the main story line, which, albeit short, is really well told like you would expect from any Schafer game. What games am I playing? There are way to much games that I want to play in the limited amount of time I have for everything 🙂 Not only are there a lot of games that get my attention, I also want to make sure my lill code projects get done in a reasonable amount of time! I used to curse at games that were too short. Now I actually secretly want them to be short, so I can continue on to the next! So many great games… much to do…. so little time…. Age of Conan ended up more or less the same… both games are not well suited for the casual player… there are a lot of mechanisms in place to help you if you only play every once in a while, but it’s still hard to get a good group and get into the really GOOD stuff. It’s easier to make the final adjustments this way. This design is about…. 5 years old now I think 😀 I’ve been really close to putting this online several times! One including a finished page with simple php cms-like code behind it, and then formatting the wrong drive on my laptop!! Well here it is then, finally, as a wordpress skin. This way I finally have a full featured CMS behind the site which means I’ll probably update it more often. WordPress may be a mess when it comes to the underlying structures, but DAMN is it easy to setup.. and the backend is REALLY nice. Well, there ya have it!